Saturday & Sunday at 6pm – Paradise Valley Rotorua. See rotoruaspeedway.co.nz for info, updates, and cancellations. Friday & Saturday 6pm – 6th & 7th April – ZM Meeanee Speedway. See meeaneespeedway.co.nz for info, updates, and cancellations. Easter Saturday 6pm – Waikaraka Park. See waikarakafamilyspeedway.co.nz for info, updates, and cancellations. 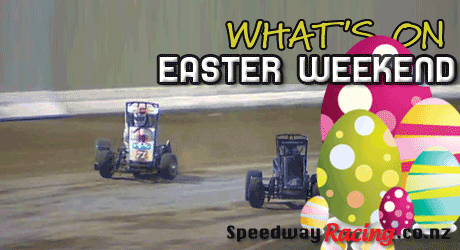 Easter Saturday 6pm – Robertson Holden International Speedway. See pnspeedway.co.nz for info, updates, and cancellations. 12noon Friday, 11am Saturday and 10am Sunday – Kaikohe Speedway. See kaikohecarclub.com for info, updates, and cancellations. Saturday 7th – Central Speedway (Cromwell). 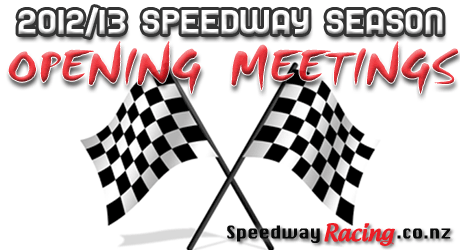 See centralmotorspeedway.co.nz for info, updates, and cancellations. Saturday 7th at 7pm – Eastern States Speedway. See easternstatesspeedway.co.nz for info, updates, and cancellations. Saturday 7th at 1pm – Moore Park Motorcycle Speedway (Canterbury). See moorepark.co.nz for info, updates, and cancellations. Friday 6th at 2pm – Riverside Speedway. See riversidespeedway.co.nz for info, updates, and cancellations. Sunday 8th at 1pm – Rosebank Speedway, Auckland. See rosebankspeedway.co.nz for info, updates, and cancellations. Please make sure you check with your local track for any changes or cancellations.